As I require every precious minute of beauty sleep possible, I wake up each morning with just enough time to brush, shower, dress, and head out to work. Eating breakfast at home would require losing at least 7 good minutes of sleep. For years I never ate anything for breakfast, usually ingesting 2000 calories at lunch to compensate for my dizzying hunger spells. Desperate to keep my 7 minutes of sleep, I started bringing food to work to eat for breakfast. I started by bringing instant oatmeal. This mushy romance lasted all of 2 weeks before I started despising the very sight of apples and cinnamon. I then moved to cereal bars. My fickle palette quickly grew tired of these as well. I've continued to seek new foods to eat for breakfast, with the nourishment relationships lasting barely longer than a Lindsay Lohan rehab stint before I grow tired of the taste, and turn my longing eyes elsewhere. I recently stumbled across a new type of granola bar that I hadn't tried. 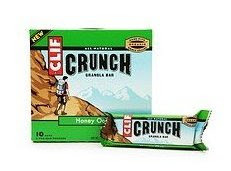 The Clif Crunch granola bar . I have long been a fan of Clif bars, but didn't know they made a granola bar. I picked the Honey Oat variety, but there is also peanut butter, chocolate chip, and other flavors. They are fairly spendy, as a box of 10 bars will run you about 4 dollars. But my curiosity got the best of me, and I picked them up. The back of this package talks about adventures and journies and other crap I glossed over. The only adventure I have in the morning is looking for an open bathroom to make dooky-time. These are a "crispy" type of granola bar, but not so much that you'll be replacing a cracked tooth later in the day. They crumble quite nicely with each bite, but herein lies their only flaw. By the end of your 2 bars, you'll be elbow-deep in granola crumbs. Be wary, lest a co-worker comes in and wonders if you've been on an all-night granola bender. I've found that by eating them over my garbage can, I avoid these crumb-causing moments. The flavor is very good. I was pleased with the quality of the ingredients, and two bars was the perfect amount for a quick breakfast. For a quick breakfast on the go, try cheese dog in a meat bun. That is a string cheese wrapped in some lunch meat. I eat it every day for breakfast with just a kiss of mustard. Yummy...and no crumbs!